Prototype: Prussian class P 10 passenger steam locomotive painted and lettered for the German State Railroad Company (DRG). Version without smoke deflectors and with a Prussian type 2�2�T31,5 tender without additional side boards for the coal bunker. This locomotive was number 11,000 in the delivery book of A.Borsig-Werke Berlin-Tegel. Delivered in 1922. Model: The locomotive has an mfx digital decoder, controlled high-efficiency propulsion, and extensive sound functions. 4 axles powered. Traction tires. The locomotive and tender are constructed mostly of metal. A 72270 smoke generator can be installed in the locomotive. The dual headlights change over with the direction of travel. The headlights and the smoke generator contact will work in conventional operation and can be controlled digitally. The headlights are maintenance-free, warm white LEDs. There is a close coupling with a guide mechanism between the locomotive and the tender and it can be adjusted for curves. The back of the tender has a close coupler with a guide mechanism and an NEM coupler pocket. Piston rod protection sleeves are included. Length over the buffers 26.3 cm / 10-3/8". A suitable collector's display case is included and is constructed of wood and glass with a backdrop relief of the characteristic Borsig gate of the Borsig locomotive works in Berlin-Tegel. There is an engraved metal plate with the builder number on the display case base. A high quality excerpt from the delivery book is included. Suitable collector's display case with a relief background for every model in the edition. Excerpt from the Borsig delivery book included. One-time series. (Model 1 of 5). 175 Years of Borsig – Pioneer Locomotive Builder of Europe. When August Borsig opened his machinery building and iron casting company in 1837 in Berlin, probably no one suspected that out of would come one of the largest locomotive builders in the world. As early as 1841 August Borsig built the locomotive BORSIG with the builder number 1 after painstaking investigation in the typical English and American locomotive types for that time. This locomotive impressed people with an improved valve gear and axle system and on July 21, 1841 a contest against an English locomotive with a 10 minute head start. From this day on the victorious path of Borsig locomotive building began that ended in 1954 after more than 16,000 finished locomotives. During the era of steam locomotive building Borsig evolved all over Europe into the greatest and second largest locomotive builder worldwide. 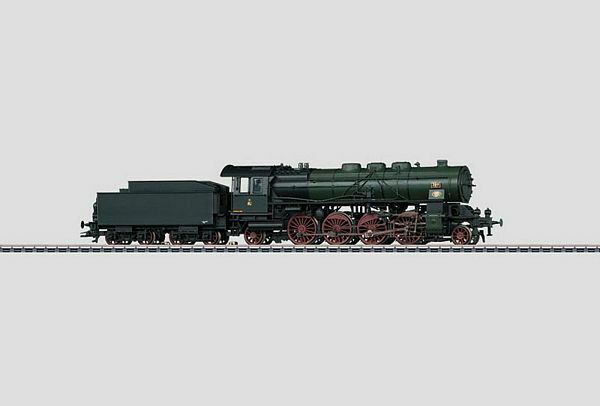 In honor of the 175th anniversary of the firm Borsig Marklin is issuing a five-part special series of sought after H0 models which will end in 2016 on the 175th anniversary of steam locomotive building in Germany. Every year a locomotive with exquisite detailing and technically premium features will issued as a one-time series. Each of these models will be delivered with a decorative display case whose backdrop will be designed with a high quality relief of the characteristics Borsig gate. In addition to the relief, the display case will be provided with an engraved metal plate showing the builder number from the delivery book. Each locomotive will also include an excerpt from the Borsig delivery book printed on high quality paper to round out this theme.